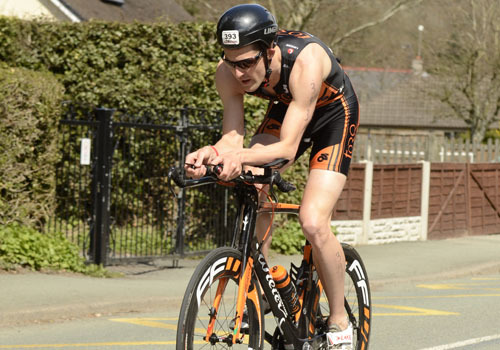 Chirk is generally considered the first proper hit out for triathletes in the North West, West Midlands and Mid-Wales, attracting the most talented people in the region. The event is extremely popular and was sold out in 4 hours! Chris Says: It’s been 6 weeks since my opening race of the year at the 2 up Firefighters Duathlon in the middle of March (which he won – JE). The weather continued to make it difficult to get out on the bike as much as I would like, so I decided last minute to take advantage of the 4 days off work and head out to Majorca over Easter to get some extra bike miles in and enjoy some sunshine. 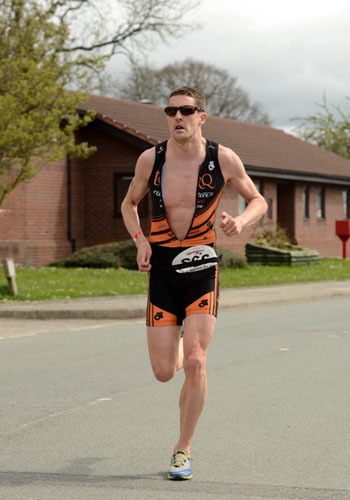 10 days later I then headed out to Kinetic PB for a week in the south of Spain which had been planned for a while to coincide with my first couple of races of the year Chirk, Majorca 70.3 and Chester Olympic (World Champs Qualifier). Usually I head out on a training camp in February/March time to try and get a boost when the weather isn’t great at home, but have felt that the benefits you get fade away by the time you start racing in May time, so this year I tried pushing the camp back a bit. The camp involved a 30 hour week with pro and talented age groupers. That gave me 10 days to try and recover before my first race at the Chirk Sprint and then a further 2 weeks to Majorca Ironman 70.3. I came back from Spain tired and must admit was right on the brink of getting ill, I had really pushed it for the week, but took it easy for the next few days and managed to ride the sniffles out without it developing any further. The Chirk Sprint has been my first triathlon of the year for probably 6 or 7 out of the last 10 years. It’s local, it’s well organised by Wrecsam Tri Club, it’s very competitive and a lot of good athletes use it to test what shape they are in. 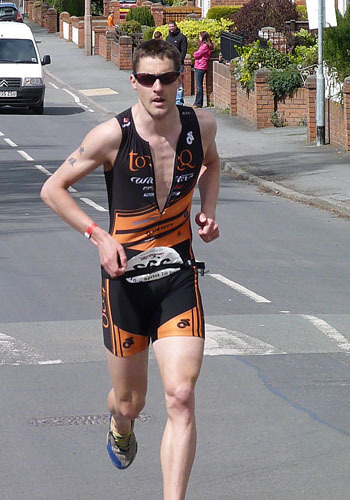 Pro ironman athlete Paul Hawkins has won the race 2006-2009 & 2012, and I have filled the gaps in 2010 & 2011. The racing has been extremely close for a good number of years over the 400m pool swim, 24k bike then 5k run to finish off. This year there were a few more potential winners: Pete Brook who has improved every year, extremely good runner, you don’t want to come off the bike with him! Chris Prior ex Cat 1 Cyclist and also very good runner who turned to triathlon last year; will make a big impact this year, and Tony Cullen 3rd year of triathlon, made some massive gains in the last 18 months, very strong cyclist and made some massive gains on the run over the winter and already won 2 races this year. (Firefighters 2up Duathlon with me and Clitheroe Sprint). As it’s a pool swim everyone goes over in waves, with the quicker swimmers towards the end. The others had already started when the last wave went off with myself and Paul in, there is very little between us on the swim and over 400m the gap will never be more than a few seconds. Over the years I have learnt that it is not worth killing yourself in the swim to gain a few seconds, just keep yourself in contention, so that was the plan, but after 100m or so, I felt surprisingly good and was opening a bit of a lead. It was just one of those days where it was coming easily and the gap continued to grow so that I had about 2/3 of a length lead by the end. I heard someone shout 4:46 so was pleased with that because I hadn’t pushed it, out the pool, ditch the swim cap and out into transition. As I’m heading out on to the bike Paul is just getting to his, it feels nice to have a bit of time to get your feet into the shoes before I expect him to catch me and the hammer to go down on the bike. The bike course is 14 miles on an out and back course, generally head wind on the way out, fly back with a tail wind. Road surface is appalling in places but you just have to go for it on the way out as this is where you make up the time. The fast guys will come back at the same speed with the tail wind. It’s the first time racing on the new Wilier TT bike, I had taken it on the camps but was now getting it’s first proper test. It feels fantastic, stiff and responsive but also glides over the bumps in the road. After 2-3 miles, still no Paul, I look round and can’t see him, time to just crack on now with my own race, putting the power down into the wind. Power meter is showing 340-350w on the way out, it feels hard but I know I have to get to the turnaround as quick as possible. After 15 mins I start to see the others on their way back, I start to mentally calculate where I am. Make the turnaround, it feels good to be up and over 30 mph after that effort, first opportunity to take a drink before head down back to T2. I see Paul coming the other way, he has lost a minute so I know he is on an off day. Into T2, 36:23 bike split including transitions, about 45 secs slower than normal, but wind has been strong on way out and into the run. The run is only 5k but it’s hard, some horrible hills. I never really get going, I know I have worked hard on the bike but give what I have. 17:12 for the 5k. It’s hard to know where you have finished until the results come out. I thought I had done enough, but as it turns out, only just! Tony Cullen was 2nd by just 10 seconds, an amazing bike split closed the deficit on the swim and similar run to mine, just losing a few seconds. Chris Prior 3rd, with a 16 min 5k bringing him into contention. Pete Brook 4th. Great to get my 3rd win at Chirk in 4 years, and 2nd win of the year. Just 2 weeks now to Majorca 70.3 which creates a whole new challenge with 4 hours of racing as opposed to 1 hour, and the potential of it being hot. Be great to try and get a podium in my age group at an Ironman branded race, that’s the goal, but have already made my mind up, no Vegas 70.3 World Champs this year (if I get the chance) with London Olympic Distance World Champs the week after, that is the big goal for the year. 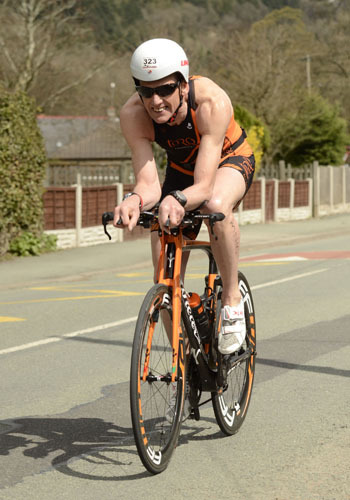 Dave Mawhinney says: The first race of the season was always going to be a jolt to the system particularly having reached the peak training phase for Ironman Lanzarote which takes place in the middle of May and having to focus on the mainly aerobic training needing to cope with the longer distance race. Having trained through the poor spring weather it was a relief to get to Chirk and experience the prospect of racing in dry but cool conditions. After racking the Wilier Twinfoil in transition is was time to get in the pool. The new tri suit seemed fast in the water and after a quick transition I was soon pedalling the Twinfoil down the Glyn Ceiriog valley. It was tough going out into the south westerly wind and the very poor road surface made it difficult to try and pick up the pace whist keeping an eye open for the pot holes, but I was soon catching people from the previous wave. Coming back toward transition was a lot easier with the wind behind you and with more people ahead to chase down. After a smooth transition I was soon out on the run but found it difficult initially to try and push the pace due to the lack of run speed training so it was a relief to get to the turnaround point on the hilly run course and reach the downhill section and head to the finish. Crossing the finishing line I was pleased to break 20 minutes for the run which included the 2nd transition time. In spite of it being a very competitive race I was pleased to finish 18th out of 400 entrants and to come 3rd in my age group (+50) just 11 seconds behind the 2nd person. With thanks to www.sportpicturescymru.co.uk for the fantastic images.